Shotaro is an average kid, but when he’s with Sakurako, they find dead bodies. 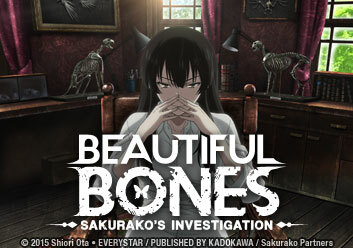 Under Sakurako’s orders, Shotaro unearths a human skull, leading to another mystery! Episode 2: Bone 2: Where’s Your House? A little girl waits for her mom outside a store, wearing a backpack stained with blood. Sakurako might be the only one able to figure out who she is and what happened to her. Shotaro and Sakurako find a skeleton in the mountains. The deceased’s granddaughter believes the police wrongly determined the death a suicide, and asks for the duo’s help. Officer Utsumi asks for Shotaro and Sakurako’s help with a friend who thinks he’s going to die prematurely due to a curse. Sakurako solves the mystery of Fujioka’s “curse”, which brings to light the existence of a mysterious art dealer. Despite celebrating, Fujioka makes a dangerous choice. Kogami searches alongside her teacher, Isozaki, and Officer Utsumi for a mysterious woman among the crowds of a summer festival, certain that the woman is in danger. At Shotaro’s school festival, Sakurako is asked to sort the school’s bone collection. Shotaro discovers something about her that may alter their relationship. Shotaro volunteers to aid Sakurako in delivering Sasaki’s remains to his family and the two find themselves in the middle of another semi-investigation. Sakurako and Shotaro attempt to help Yuriko find out which painting of her grandfather’s her grandmother wanted to give her. As Sakurako enlists Shotaro’s help for the year’s final bone search, Isozaki calls to request their aid in finding a missing student. Three of Isozaki’s students were inseparable until one vanished. As one of the remaining two disappears, Sakurako begins to assemble the bones of a more nebulous skeleton. With his life once again becoming far too normal, Shotaro recalls his initial impression of Sakurako and the first mystery they solved together.